Dancer, choreographer, professor, administrator, yogi. Janet Lilly is all of the above, which is what you might expect of someone who understands the importance of being open to possibilities. Lilly (MFA ’92), head of the Department of Dance at the University of North Carolina-Greensboro (UNCG), has enjoyed a successful and diverse career thanks to hard work, great talent, and being open to new challenges and opportunities. Before and after obtaining her BA in dance from New York University in 1982, Lilly enjoyed working as a professional dancer, most notably as a principal in the celebrated Bill T. Jones/Arnie Zane Dance Company, with whom she danced from 1983–91, also acting as master teacher, rehearsal director, and choreographic assistant. But her interest in choreography was growing. “I was having trouble identifying only as a dancer,” she said. “I needed a lab situation—that’s what attracted me to grad school.” She chose Michigan because she felt the faculty was representative of the “working university-based artists” with whom she wanted to study. She graduated with highest honors. A few years later, after starting a family, Lilly was offered a position teaching at the Peck School of Arts Department of Dance at the University of Milwaukee-Wisconsin, where she spent the next 15 years. 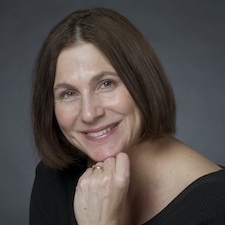 At Peck, Lilly was instrumental in creating a low-residence MFA program for returning dance professionals, and also served as the department’s chair from 2005 to 2009. She took up her position at UNCG in 2011. She still teaches, both at UNCG and as a guest artist on college campuses across the country and abroad. “I’m at the point in my career where one of the things I love to do most is work with young dance artists,” she said. Recently, a number of students in the Department of Dance at SMTD benefited from Lilly’s love of teaching when she returned to help prepare them for the February performances of D-Man in the Waters (Part I), one of the seminal dances of the Bill T. Jones/Arnie Zane Dance Company. Lilly had appeared in the world premiere of the work in 1989 and, at the suggestion of Angela Kane, chair of SMTD’s dance department, she was invited back to teach a master class and to conduct the preliminary auditions for the performance. Lilly taught the auditioning dancers some phrase material, then created small groups and had them improvise for five minutes to Mendelssohn’s Octet for Strings, the music of D-Man. Because this was the process by which the piece was originated, the students got a taste for how one of the classic works of modern dance was actually created. Those who made it through this preliminary audition represented a wide range of body types; the great variety was in keeping with the aesthetic of Jones and Zane, with which Lilly was very familiar. From the pool of dancers that she chose, the performance was cast by Germaul Barnes, also a Bill T. Jones/Arnie Zane Dance Company alum, who staged the work at U-M. Prior to the performances, Arthur Aviles, who starred with Lilly in the 1989 D-Man world premiere, arrived at Michigan to conduct master classes for the entire dance department. With Lilly and Barnes, he participated in a public panel discussion—along with associate professor and rehearsal director Judy Rice and two students—that explored the history of the work and the challenges of dancing and staging it. Evolution is a theme in Lilly’s career, which has recently grown to include a series of visits to India in which she has developed a vibrant relationship with the dance community. This new phase came about thanks to her work as a yogi. Lilly began doing yoga in grad school when she studied with Laurie Blakeney at the Ann Arbor School of Yoga. “I felt that I was engaging in my body in new ways and yet with the same degree of immersion that I found in dancing,” she said. After many years of practice, she traveled to Pune, India in 2001 to study yoga at the Iyengar Institute, returning again in 2005. At that point she decided she wanted to bring dance and yoga together, so she applied for a Fulbright Lecturer’s Award, submitting a proposal to work with classically trained dancers using contemporary choreographic methods and structures. She received the Fulbright and was invited for a four-month residency at the University of Pune. During that time she also traveled to Mumbai, Calcutta, Delhi, and Bangalore, developing dance connections and teaching classes. She’s now been to India six times, and recently added Sri Lanka to the list of places where she’s taught. Lilly is optimistic about the future of dance. She feels there is more opportunity now, with more grassroots movements and many performance possibilities. She also notes that dance studios and schools that focus on competition provide a new source of employment for many dancers, as does the physical culture field that includes yoga, Pilates, and Alexander technique. In other words, they need to stay open to the dance of possibilities.